The collection is of vital use to Jowett owners today as it contains technical information that should ensure the smooth running of vintage Jowetts. For everyone else, the photographs and advertisements provide lots of information about a famous Bradford company that produced reliable, economic and distinctive cars that were much loved in their day, and still remain so today. The advertisements are especially interesting because a distinctive style of advertising evolved at Jowett during the 1920s, combining humour and customer testimony as to the economic running costs and reliability of the cars. The photographs in the collection are equally fascinating as they show various Jowett cars competing in international races such as the Monte Carlo Rally and the Spa 24-hour race in Belgium. Other photographs reveal how the Jowett motor car attained a global reach, for instance a photograph of the Cairo Jowett owner’s club meeting in 1927 and photographs of Jowett cars in North America. 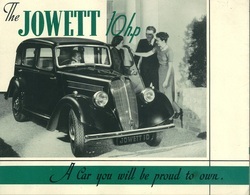 The Jowett Company was established in Bradford in 1901 by Benjamin, William and Ruth Jowett, and initially designed and built engines, but they also designed a car in 1906. In 1910 they decided to produce the car commercially, manufacturing almost 50 cars between 1910 and 1916. The First World War saw production cease to help the war effort but a purpose-built factory at Five Lane Ends at Idle enabled car manufacture to start again by the 1920s. A range of reliable models at economic prices meant that sales grew throughout the 1920s, prices for Jowett cars in 1927 ranged from £139 to £185. The 1930s were more difficult with a factory fire in 1930 and worldwide depression hitting sales, so Jowett focused on the production of basic commercial vans. World War Two saw the factory redesigned and the workforce expanded mainly by women to produce field guns and ammunition. The company continued to plan for the production of cars suitable for the world market, and after the war Jowett produced the Bradford van, the Javelin and the Jupiter cars. Unfortunately, the Javelin was not the success that Jowett had hoped for and by 1953 the company was in serious financial trouble and ceased trading. View the entry in our online catalogue.